Dear students, here is an important paragraph for SSC and HSC. How it affects our environment? What are the effects on animal life? What should we do in this regard? Global warming means increasing the temperature around the earth. Now it is considered to be one of the great problems in the world. 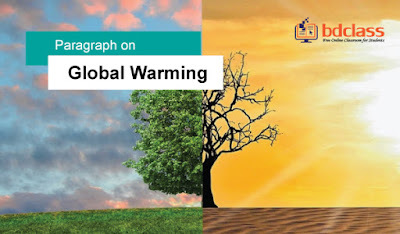 In recent years, we have found some alarming reports that provide evidence that the world temperature is increasing day by day. There are many reasons for this problem. Firstly, increasing carbon dioxide around the world is responsible. Secondly, cutting down of forest is also responsible for that. Thirdly, the greenhouse effect causes global warming. There are many bad impacts of global warming. This could reduce mankind's ability to grow food, destroy wildlife and wilderness, raise sea levels and thereby flood coastal areas and farmlands. It may cause frequent natural calamities. As a result of the rise of the sea level, southern part of Bangladesh may go under water one day. The destruction of forests is causing extinction of various plants and animals. To stop global warming we should plant trees in large number and preserve the forests.